It is well documented that manufacturing methamphetamine (meth) is a dangerous and hazardous process. In order to produce this illegal drug, many toxic chemicals are required. Furthermore, the manufacturing process releases some of those toxic chemicals into the air, which presents a serious danger for anyone close to the scene. Recognizing this danger, the Commonwealth of Virginia has specific laws in place to prohibit the manufacture of meth. These laws exist in addition to provisions governing the manufacture of other illegal drugs and controlled substances. Additionally, the penalties for manufacturing meth are extremely harsh under Virginia law. Under Code of Virginia Section 18.2-248.03, it is illegal to manufacture meth. It is also unlawful to possess meth with the intent to manufacture. Section 18.2-248.03 applies to meth itself as well as any derivatives, including salts and isomers. Meth manufacturing of 28 grams or more — Results in a prison sentence ranging from five to 40 years as well as $500,000 in criminal fines. At least three years of the prison sentence must be served consecutively with any other criminal convictions. At least 227 grams — Results in a prison sentence ranging from five years to life as well as $1,000,000 in criminal fines. At least five years of the prison sentence must be served consecutively with any other criminal convictions. A disabled, incapacitated, or helpless person of any age. Hotel rooms, as defined in Code of Virginia Section 35.1-1. Any person who violates Section 18.2-248.02 is guilty of a felony. Upon conviction, the offender will face a prison sentence between 10 and 40 years. The penalties under this section are in addition to and must be served consecutively with any other criminal convictions. If you are facing criminal charges for meth manufacturing in Virginia, it is wise to reach out to an adept criminal defense attorney. 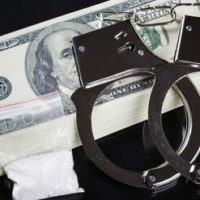 The Leesburg drug crimes attorneys at Simms Showers LLP, servicing Leesburg, Winchester, Fairfax, and Manassas, feature demonstrated aptitudes in the arena of criminal defense, including meth manufacturing and other drug crimes. If you need legal help with criminal defense, contact us today for a free initial consultation.